Higurashi Falls (日暮の滝) is located at Mt. Komagatake. It is huge 3 steps 25m tall waterfalls that you can see from the ropeway. There are parking and restroom. There is street regulation. You can drive up until Suganodaira Bus Stop. You have to use the shuttle bus and the ropeway. Admission for both the shuttle bus and the ropeway: 4320 JPY. 1. use a local bus to Shirabidaira Station. 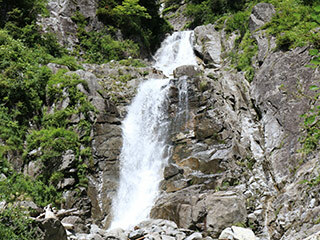 Higurashi Falls is located in Miyata, Nagano Prefecture. It is 3 steps 25m tall waterfalls. It has a beautiful water from the ice melted water from Mt. Komagatake.